Seattle SFTE Celebrates the 50th Anniversary of the Society! 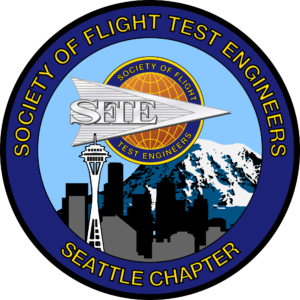 On June 1 and 2, 2018, the Seattle Chapter celebrated the 50th Anniversary of the founding of SFTE in a two-day event at the Museum of Flight in Seattle, WA. 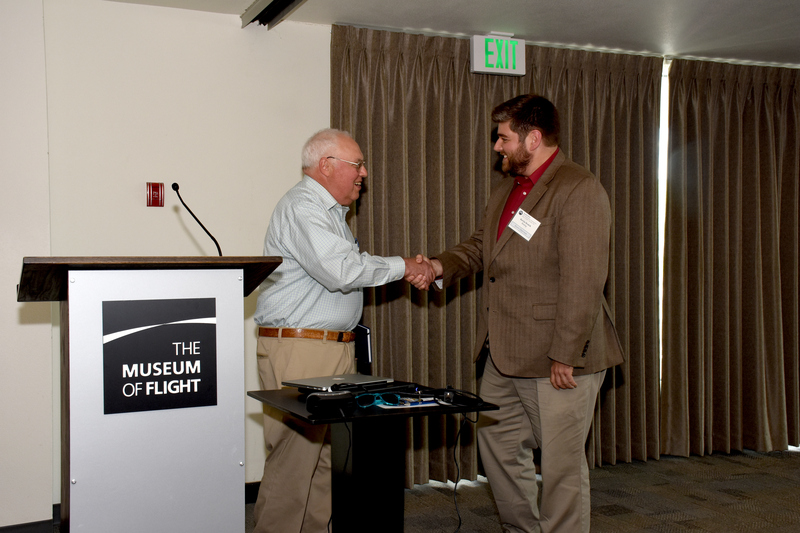 The first day, Friday June 1, was a day-long Symposium, featuring presentations discussing both the history of flight testing and projects looking toward the future. 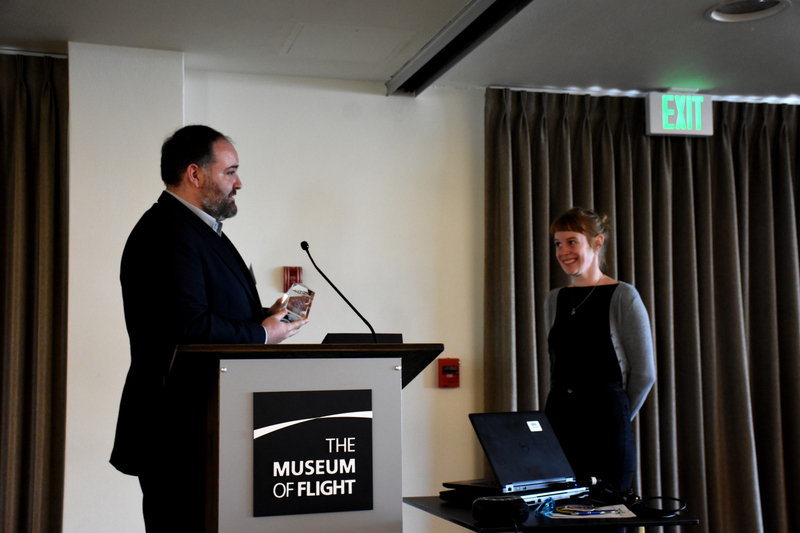 The second day, Saturday June 2, was a public Celebration where the Seattle Chapter and attending alumni interacted with the public about flight testing at the Museum of Flight. 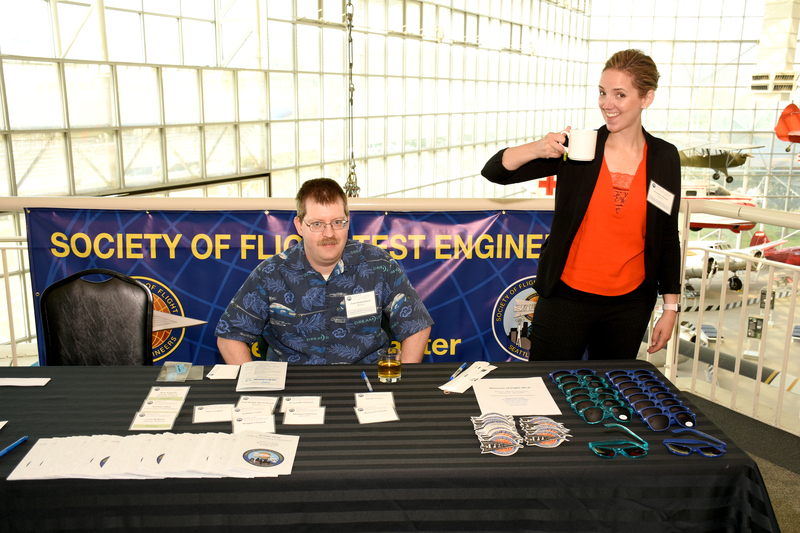 Tom “Oddball” Osmundson, Seattle Chapter Treasurer, and Jennifer Boyles, Seattle Chapter Secretary, at the check-in table at the start of the Friday Symposium. 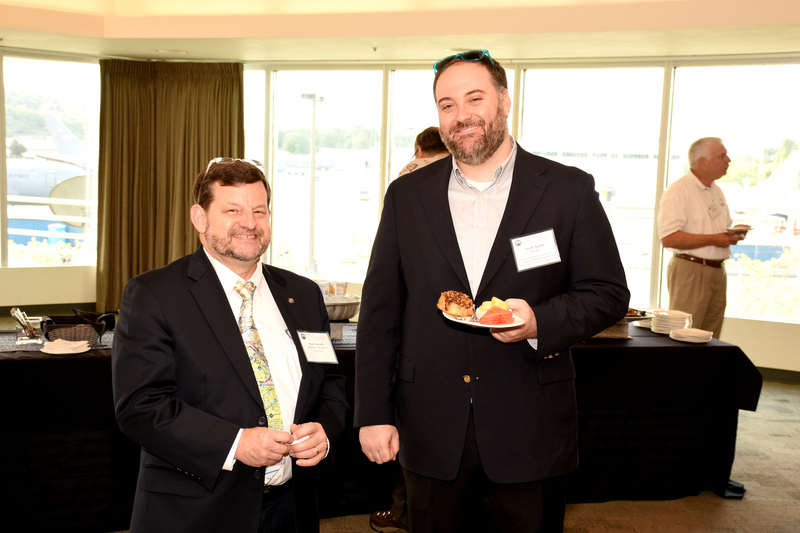 Pete Donath and Noah Aaron enjoy some breakfast before the Symposium starts. 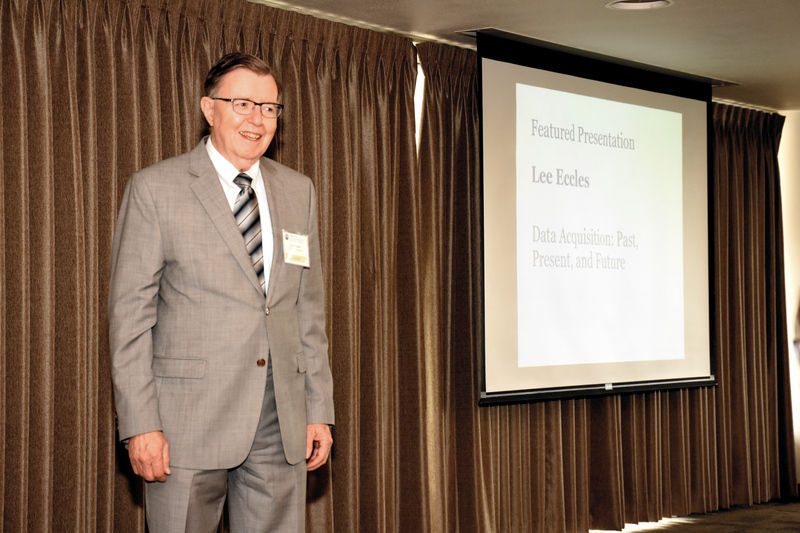 Lee Eccles gave the Featured Presentation entitled “Data Acquisition: Past, Present, and Future,” where he talked about the history of data acquisition at Boeing and in flight test generally, from the 1960s up to today, and where things may go in the future. The history of flight test data is also the history of computing, and it was fascinating to trace the origins of how we do things today to their origins at the dawn of the computing age. John Whitworth, a founding member of SFTE, gave a talk about the formation of the Society, the reasons why the founders felt a Society was valuable, and the creation of the initial batch of regional chapters, with some brief history of Boeing flight test from that period. Bob Bogash, retired Boeing Quality and Field Service engineer, is being thanked by Kevin Welch, Event Chairman, for being a surprise speaker at the end of the first session. 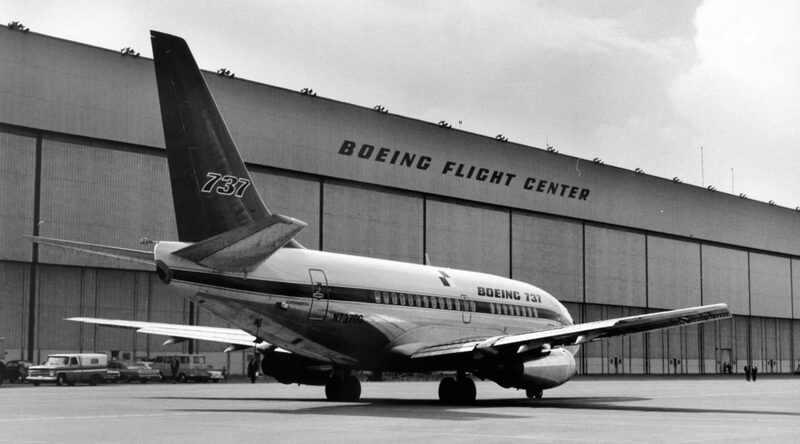 Bob now volunteers at the Museum of Flight and completed the acquisition of many airplanes for the Museum's collection, including the prototype 737, PA099. 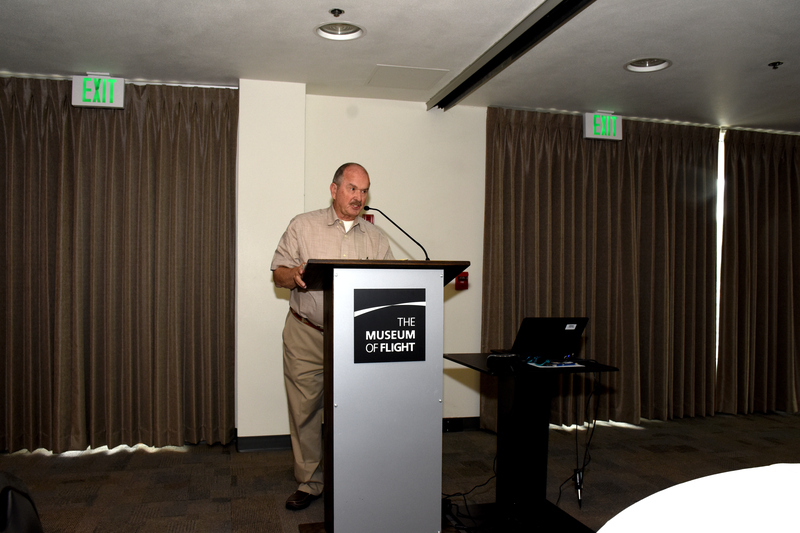 His talk was on the 50 year history of the 737 program and about how he acquired PA099 for the Museum. 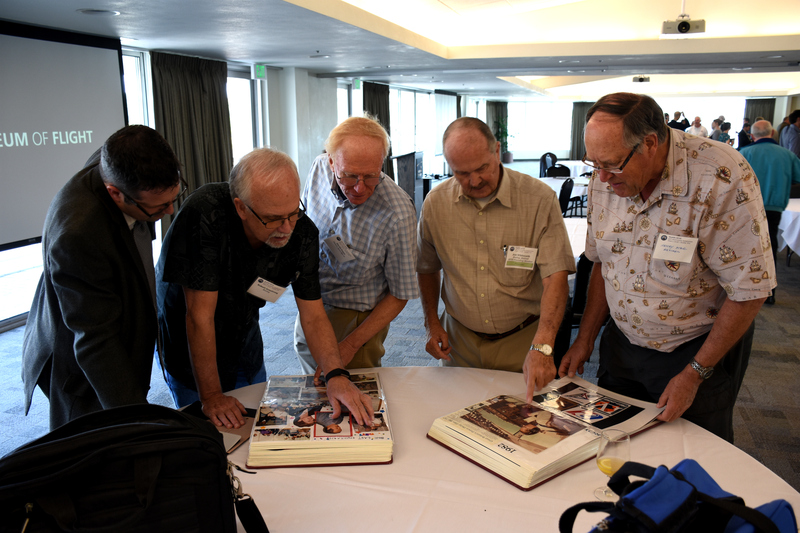 During lunch, Symposium attendees look at scrapbooks covering several decades of John Whitworth's career at Boeing. From left to right: Darren McDonald, Bob Armstrong, Dave Jones, John Whitworth, Henry Stahl. 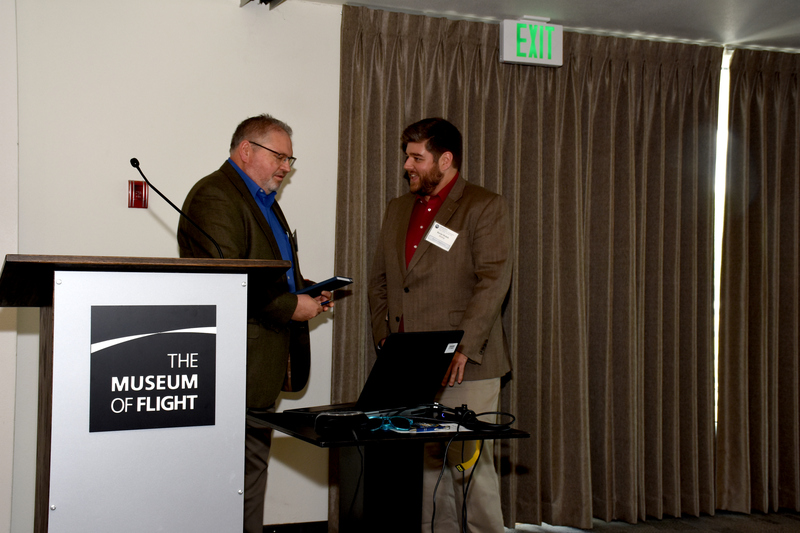 Mark Malone, Boeing Physicist and Associate Tech Fellow, is being thanked by Kevin Welch, Event Chairman, for his presentation on using image processing and recognition software to automatically extract flow data from flow cone video, which both reduces the time required for data reduction following flight and allows for better data fidelity. 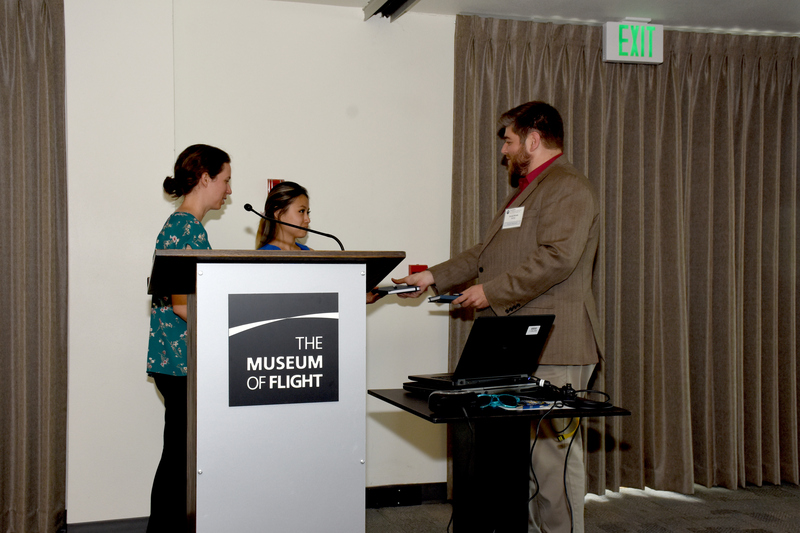 Karine Chen and Hannah Rota, University of Washington Students, are being thanked by Kevin Welch, Event Chairman, for a presentation about their flight test project to show how small unmanned vehicles can perform position estimation in a GPS-degraded environment. They gave an overview of their project and results, and included several entertaining videos of their testing, which was made all the more challenging by the wind conditions at their test site. Hilary Lawlor acceps her Best Presentation Award from Seattle SFTE Chapter President Noah Aaron. Hilary gave a talk about her research into printed sensor technology. This tech would allow for inexpensive and innovative installations of skin sensors directly on the surface of aircraft parts. Several founding and long-time members of the Society who attended the Symposium. 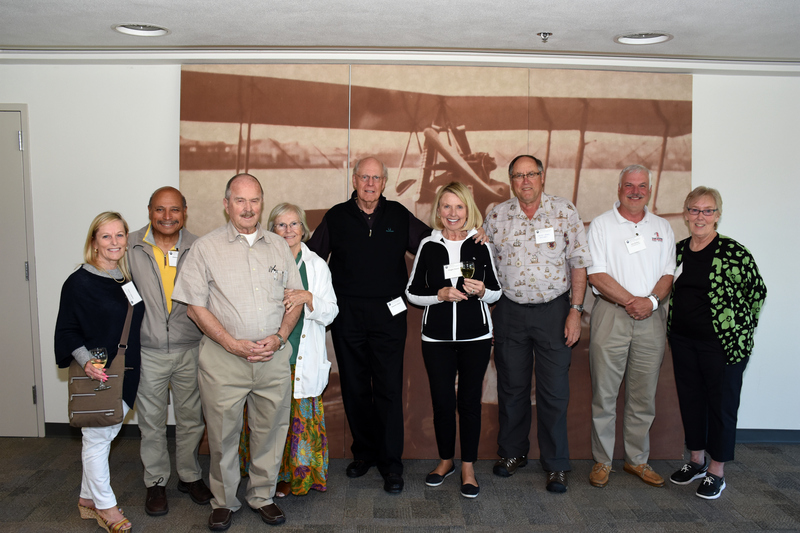 From left to right: Judith Cettel, James Raphael (founding member), John Whitworth (founding member), Sherry Whitworth, Kenneth Chmiel, Maggie Chmiel, Henry Stahl, Dan Hrehov, Ann Cooper. Tyler Wilson and Henry Stahl enjoy a cocktail at the reception following the Friday Symposium. SFTE Members enjoy a cocktail at the reception following the Friday Symposium. From left to right: Bob Armstrong, Mark Malone, Michael Closson, and Mark Wilson. The Public Panel Discussion on Saturday. 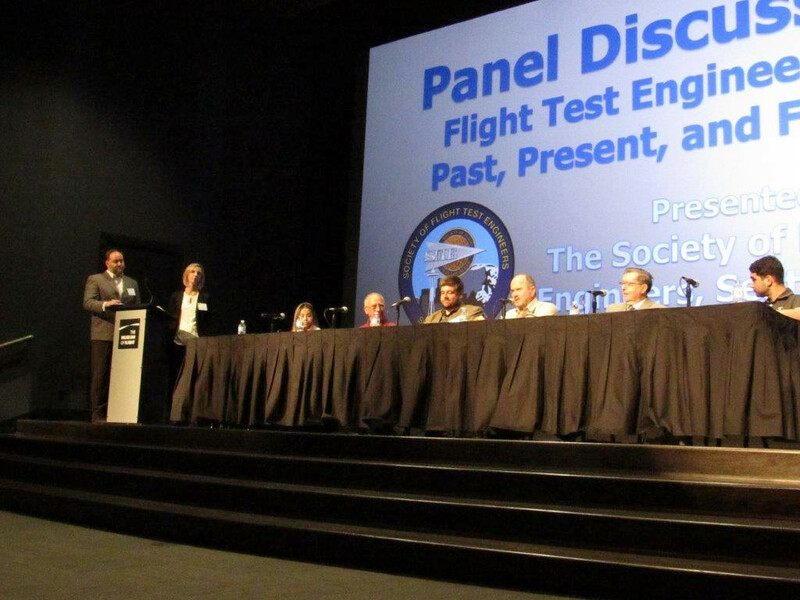 Topics covered by the panelists, who came from diverse backgrounds, included descriptions of how they got into flight testing, stories of things that happened during flight test, and comparisons of the various roles in a flight test program. The panel also took questions from the audience. Moderators standing on the left are Noah Aaron and Jennifer Boyles. Panelists seated from left to right: Karine Chen, UW graduating Senior in Aerospace Engineering; Leon Robert, Boeing Test Pilot, retired; Kevin Welch, Boeing Flight Test Engineer; John Whitworth, Boeing Flight Test Engineer and Manager, retired; Lee Eccles, Boeing Data Systems Architect, retired; Ramy Mourad, Boeing Flight Test Program Manager and former Eclipse Flight Test Engineer. 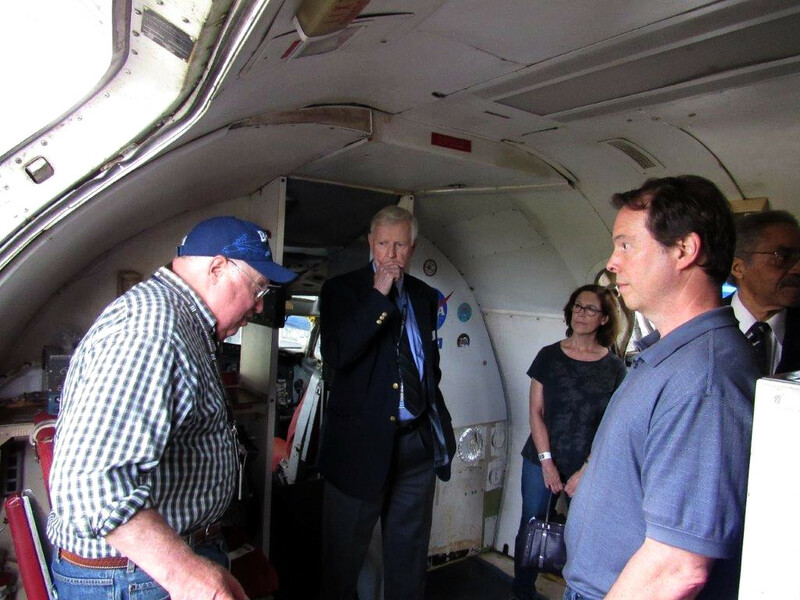 Bob Bogash (left) tells flight test stories to the public on PA099, the prototype 737, during the Saturday Celebration Event. 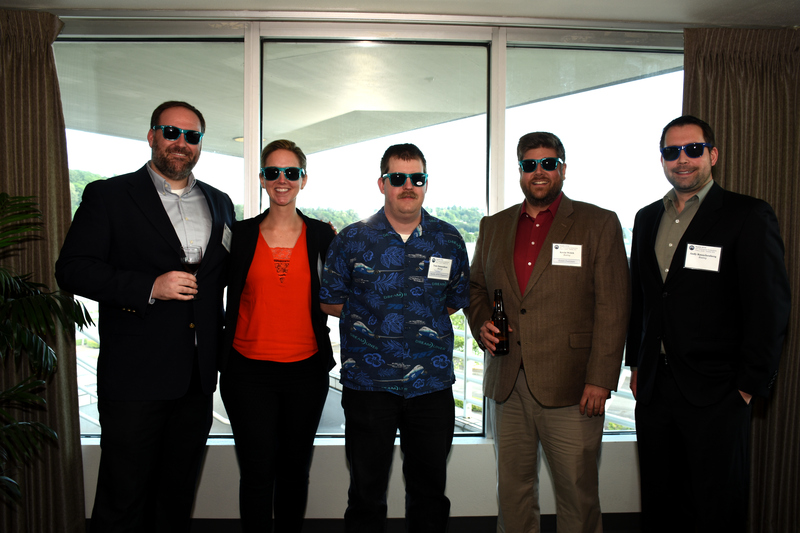 The Seattle SFTE members who made the event happen, sporting the sunglasses handed out as door prizes. 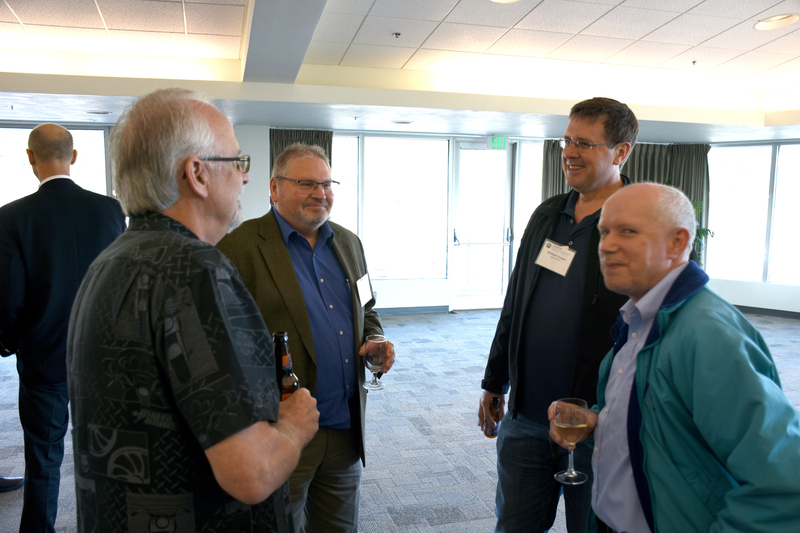 From left to right: Noah Aaron, Seattle SFTE President; Jennifer Boyles, Seattle SFTE Secretary; Tom Osmundson, Seattle SFTE Treasurer; Kevin Welch, SFTE International Board of Directors and 50th Anniversary Event Chairman; Andy Rauschenberg, Seattle SFTE Member. All four of the museum's 7-series test airplanes (727, 737, 747, 787) will be open to the public for viewing. SFTE Members will volunteer as docents to engage with the public on the airplanes. 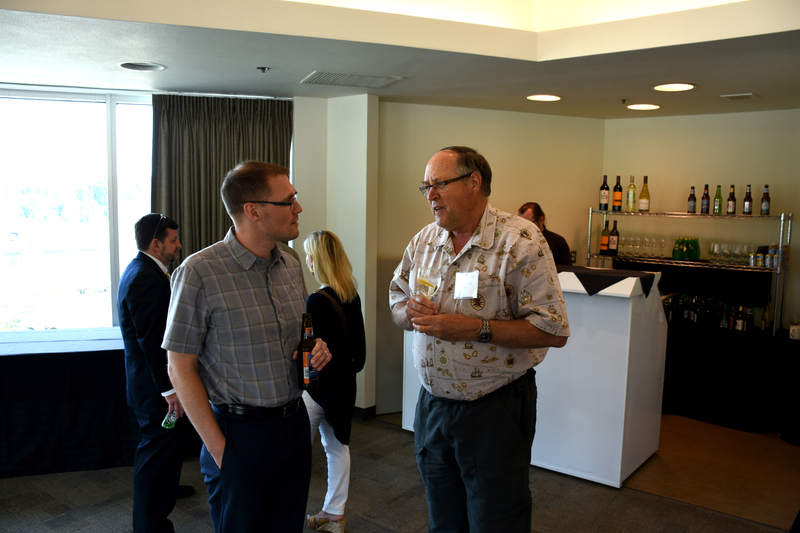 The event was held at the Museum of Flight, 9404 E. Marginal Way, Seattle, WA 98108, in the View Lounge. SFTE is a fraternity of engineers whose principal professional interest is the flight testing of aircraft. The objective of the Society is the advancement of flight test engineering throughout the aircraft industry by providing technical and fraternal communication among individuals, both domestic and international, in the engineering fields of test operations, analysis, instrumentation, and data systems.